Home » Animals » There’s no i in team, but there are two u’s in shut up. ← Only the best dressed fleas for MY pets. There’s no i in team, but there are two u’s in shut up. Or even worse, they assume something completely moronic and then lash out like they know everything? And why is it some people run the minute there is any conflict? How can you get to be that old and not have learned SOME communication skills?? I do have some funny stuff from around the web to amuse you, mostly brought to you by a couple of my readers. Yes, I’m phoning it in. Here is a fun one: Toilets of the World Quiz (thanks to reader Fumiko G.). They show you a picture of a bathroom, and give you a choice of three cities. I got 6/10. If you play, come back and post your scores in the comments. Do you need a Halloween costume? Here’s an idea (again, thanks to reader Greg V.)…. If you wear this, I want to see pictures. The t-shirt says it all, mostly. Actually, it really does not explain enough. Cats stealing dog beds (again, thanks to reader Fumiko G.). I love this one! Especially because in the end you see that most (probably not all) of the kitties weren’t trying to hog the bed to themselves, but were willing — even happy to — share the bed with the dog. It just took the dog a while to get it. I only got half right on the Crapper Mapper. I guess I need to travel more. 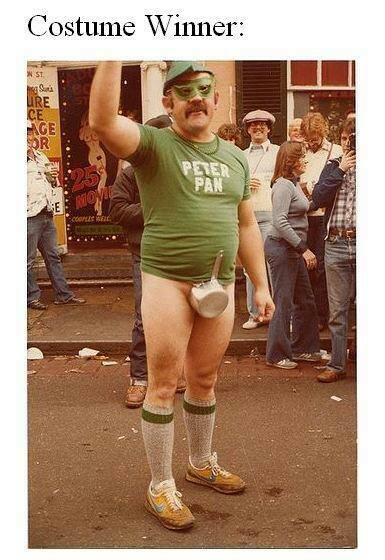 AND We have Peter Pan, but where’s Puss in Boots? Some of those crappers made lessened my desire to travel to foreign lands. The Puss was already in boots a couple months back. She looked good in them, but I suspect they smelled. Pye didn’t seem to mind. It was 6 of 10 for me. But there was one ambiguous question in there. The correct answer to number 10 was Smithsonian. I guessed Space. So I was half right because it HAD been in space. That one got me, too! I have to agree with you on that one; it was a trick question. But I’m still not sure how one would “use” that particular toilet.